The hotel’s entrance area, with a reception in the main role, is a place of particular value. It is here where the first (and last) contact of the guest with the facility takes place. And because one cannot make the first impression twice, it is worth trying to make it a favourable one. The appearance and arrangement of the reception area exposes the character of the hotel and way of treating its guests. Every detail matters. How to design this space to efficiently serve and pleasantly surprise guests? How to while away their hours for check-in? How to ensure sparkling cleanliness, safety, and comfort? How to make the honest smile of the receptionists the icing on the cake crowning a pleasant, trouble-free stay? The following article is devoted precisely to these issues. Just as the hotel bathrooms have their own requirements, strictly defined by the regulations (which we wrote about on our blog here), also the reception space is subject to formal requirements. Before you start designing a hotel reception, it is worth recalling the standards regarding the surface, equipment, and functions which should be met in the assumed category of the facility. Current legal guidelines are available here. How was the Guest persona defined? There exists no universal recipe for the perfect reception. It all depends on who it is to serve. How does the investor define the character of the hotel? For whom is it being built or renovated? Will it be a metropolitan business facility, an intimate hotel for lovers, an exclusive spa for mature ladies and gentlemen or an economical hotel for families with children? How many stars should it receive? The needs and preferences of the guests determine both the style of the arrangement and the functions carried out. Style. Stand out or die. Currently, the owners and managers of hotel facilities are doing their best to ensure that the hotels are not bland and dull, quite the contrary – they would like them to be expressive and with character. The architects they employ know that you cannot overdo it because comfort and functionality count most in the hotel. A visitor should feel even better here than they feel at home – carefree and pleasant. The arrangement of the hotel’s space is supposed to have personality but not for the price of overwhelming the guests with any unnecessary excess. A stylistic expression which does not irritate – this is a challenge for designers. In the photo: “Mortęgi Palace” in Lubawa, Poland. The interior design of the hotel has to harmonise with the architectural shape of the building. Before a guest approaches the reception counter, they have to make their way from the front door. The entrance has to be designed so that it is protected against excessive inflow of air from the outside. There should be no threshold in it which makes it difficult to move suitcases on wheels (or wheelchairs); the self-sliding door for photocell and air curtain is a convenient solution. In five-star facilities a separate entrance and a special, separate path have to be provided for the luggage of guests. The reception counter is not an ordinary piece of furniture. Its front should be fancy and at the same time convenient for users, always clean, durable, and elegant. Counter from the inside (or the inner part of the reception), conceals discreetly the mass of cabinets and shelves with documents, necessary electronics, monitoring preview, computers, printers, lockers, money boxes, deposit safe, payment terminal, first aid kit, trays leaflets promoting additional hotel services, maps and guidebooks around the area, description of attractions, and many other things. If the hotel uses traditional keys instead of coded magnetic cards, one of the most important elements of the reception equipment is the key cabinet. What should we build a reception counter of? The most popular materials include stone, wood, ceramics, brick, glass, and concrete – and their various combinations. Ceramic cut mosaic and glass are enough to impressively finish the front of the reception counter. The receptionists’ stand, obviously, has to coherently connect with the rest of the space, maintaining the proportions, colour tone and general expression of the applied finishing elements. 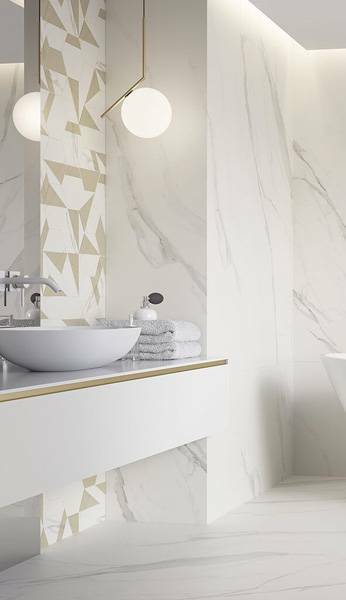 The interesting method of contrasting the size of ceramics presented above – a large-format floor and horizontally arranged, cut strips of a ceramic mosaic in the same colour – is stylistically consistent. The chic of contrasting white and graphite. A large format on the floor and a decorative strip of ceramic mosaic on the wall. White and fashionable grey – these two shades are enough to arrange a multifunctional reception. In the photo: the reception of “Gastro Gal-Dental-Res” in Rzeszow, Poland. In contemporary hotel assumptions, the space of the reception hall is starting to perform more and more functions. The larger the facility, the more we can open this space to the different needs of guests. Apart from waiting for the time to take the keys, we can carry on conversations here, take advantage of small services (catering, care), read the press (and sometimes even books because here and there you can find mini-bookcases, available to guests). Contemporary receptions of large hotel facilities are part of a larger whole. In the photo: “Borowy Dwór Biznes & SPA” in Cracow, Poland – Arkesia collection. Since the hotel lobby has a lot of traffic, all the equipment used there must represent quality at the highest level (otherwise they will be prematurely damaged, exposing the facility owner to considerable repair or replacement costs). The reception is a place which is stylistically matched with the rest of the hotel hall but quite clearly marked. Cleanliness is one of the first factors subject to strict evaluation of quests. In the reception hall, cleaning is almost a permanent activity because of the traffic prevailing there. Cleaning should be discreet, fast, and efficient. The fewer recesses, hollows, and places where dust accumulates – the better. Similarly as in the case of colours and textures. These very bright and very dark ones are particularly demanding because any dirt can be easily visible on them. It is definitely more practical to choose the colours and surfaces masking the first signs of dirt. 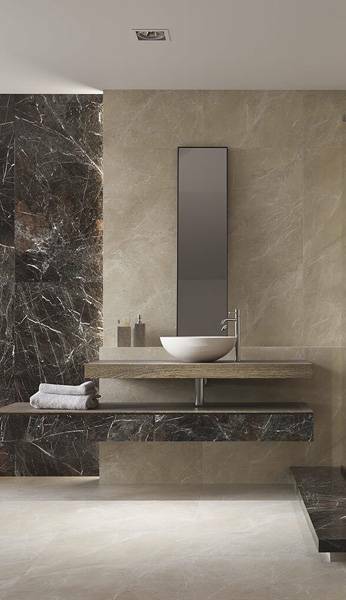 Ceramic tiles in natural stone and wooden colourations works perfectly well. And, most importantly, they are resistant to mechanical damage and ready for the continuous movement of wheeled suitcases, luggage carts, and high heels, without revealing any signs of wear. No dirt will be visible on the graphite tiles. 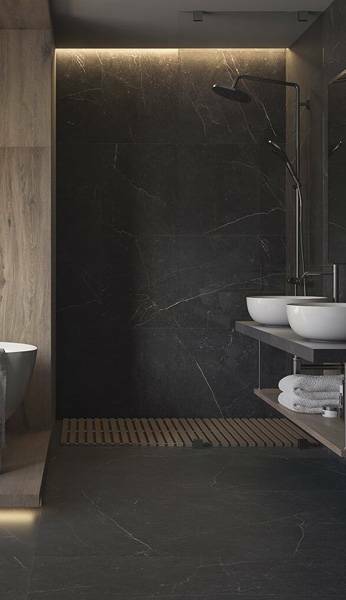 Stone tile graphics favours the impression of neatness and elegance. In the photo: “Borowy Dwór Biznes & SPA” in Cracow, Poland – Arkesia collection. 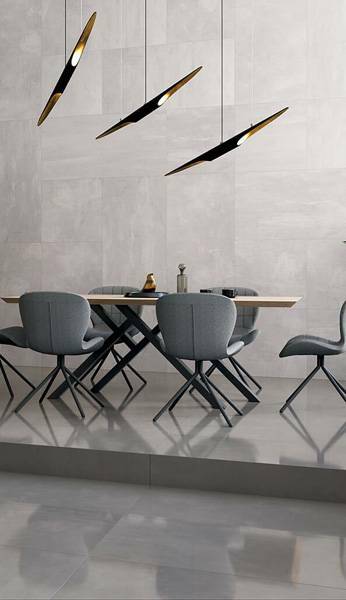 For spaces with intense traffic, with the presence of certain amounts of abrasives, it is best to choose glazed stoneware tiles with PEI 4/6000, 5/12000 parameters or unglazed stoneware tiles (the most impressive ones will be made in double-charge technology with the tonal effect of a unique surface). More information about the technical parameters can be found in our handbook. Naturally, you need to remember about special wipers which stop dirt in the entrance area. In addition to the convenience and beauty of the furniture in the reception hall and the order prevailing there, acoustics is particularly important. Ceramics, concrete, stone, and glass are the sound reflective surfaces. Therefore, during the design process, it is worth to carry out acoustic simulations and see how the sounds will spread in particular parts of the hall and then properly neutralise the effect of these reflections. Plush couches and armchairs with high headrests will make part of this task – the rest can be entrusted to professional ceiling and wall solutions. For instance, a green wall with living plants will not only decorate the space and provide it with natural element, but it will also effectively improve the acoustics of the room. An integral part of the reception is its backroom space. The reception staff should have there the clothing wardrobes, the possibility of ironing, and the indispensable sanitary facility. Typically, this space also has a window which gives access to daylight and fresh air. What is more, here we should also take care of an impeccable order. When designing a hotel facility, you need to ensure the comfort of its employees, as it directly translates into the quality of guest service. When designing a hotel reception, legal requirements should be taken into account. The reception is a highlight of the hotel – its appearance and organisation shape the opinion of the guests about the facility. The arrangement of the reception (as well as the entire facility) should harmoniously interact with the architectural shape of the building and its character. A reception counter is a piece of furniture of particular importance. The quality of the equipment elements directly affects their longevity, thus it pays to choose them very carefully, taking into account both the aesthetic values and durability. Finishing materials for the hotel reception are also worth choosing for the ease of cleaning. When designing the space of the reception hall, you need to remember about acoustics. Do not forget about the social and sanitary facilities for employees.